The eroding of the Florida Gators‘ 2018 recruiting class continued Thursday night as four-star quarterback Matt Corral (Long Beach, CA) flipped from Florida to Ole Miss. The No. 60 overall player in the Class of 2018, Corral committed to the Gators on July 22 but flipped to the Rebels just six days after visiting Ole Miss for the first time on Dec. 8. Ole Miss paid him an in-home visit on Thursday that sealed the deal. Corral has not specifically said why he left Florida’s class, but it has been relatively clear from the start that new head coach Dan Mullen did not make him a priority upon taking the job. He was expected to take an official visit to UF this weekend, though it would appear that is off the table at this point. Florida has now lost three of its top-rated commitments since the departure of Jim McElwain as Corral has joined four-star wide receivers Jacob Copeland (Pensacola, FL) and JaMarr Chase (Metairie, LA) as players who have rescinded their pledges. Copeland and Chase rank No. 53 and No. 74, respectively, in the 247Sports Composite. 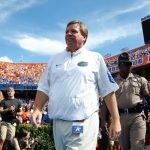 The Gators’ class is now ranked 19th nationally and seventh in the SEC with just 12 verbal commitments headed into the first-ever early signing period, which begins on Dec. 20. Florida at one point had one of the nation’s top eight classes, a group filled with tremendous offensive firepower. 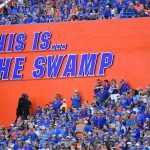 Due to a combination of players leaving the program due to Mullen pulling offers and others departing both before and after his hire, the Gators have a ton of work to do before the end of the month and heading into National Signing Day in February. 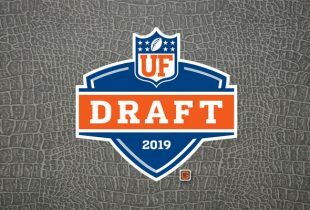 With Corral decommitting, Florida has redshirt sophomore Feleipe Franks, redshirt sophomore Kyle Trask, redshirt freshman Jake Allen and potentially redshirt senior Malik Zaire returning as quarterbacks next season. So the Florida Gators can recruit again, huh? This is devastating. Mullen screwed this up. Should have been the 1st phone call/visit he made. How bad is it at UF when a kid would rather go to a school in turmoil and possible probation than Gainesville? I really liked Corral, but there’s a reason that he wasn’t the very first visit (or 2nd, 3rd, 4th. 5th…). There’s also a reason that a Top 5 QB has very few committable offers and ends up at a middle-tier school on probation. If it makes you feel any better, know that Mullen was in-home with Emory Jones on the day Corral decommitted. Jones dropped his plans for the weekend and is currently on campus. Mom will be here as well. Deep breaths, Mullen has a plan and MC just isn’t part of it. Hilarious. What will you say if he flips Emory Jones? Or lands a comparable QB that is better-suited for his system? “Great job?” “I was wrong?” Or just fade into the woodwork? I’m not worried. He wasn’t a good fit for the Mullens’ spread offense. Mullens knows what he’s looking for and his message to the better fit QBs out there will ring true. It would have been worse If Corral had come in under McElwain as HC, with no improvement in the offensive strategy and scheme, he would have been ineffective. Also remember, Corral switched high schools because of what he felt was unfair treatment and then decommitted from USC as well. I don’t feel we could have trusted him to stay with us if things didn’t go they way HE expected. Good luck at Ole Miss Matt. Get ready for the culture shock of the deep South culture, small town living and NCAA penalties. I’m more concerned about the defense. We need 3-4 4 star LBs and 2-3 D linemen to run Grantham’s 3/4 scheme. Let’s get the 5 to 7 early signees who want to Gators on board. We will get a quality QB, WRs and O Linemen we need on Nat’l signing day. 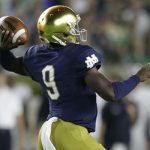 If Zaire applied and would be able to get a sixth year of eligibility, when would he find out? That guy needs to get on with his non-football playing life. Wait a minute, does he still plan to visit UF tomorrow? Can we still expect that he may swing back to us after or during the visit? A 6th year for Zaire??? Is that even legal??? Oops forgot who we are!! Forget the rules and bring on that 6th year!!! To H?LL with the 5 star passing qb who is now a 4 star!!! HAHAHA GOT WHAT YOU DESERVE!!! Zaire is captain average and also a crybaby that left notre dame for silly reasons. But here under Dan he will be a LEGEND IN HIS OWN MIND!!! Mullen hates 5 star players anyway unless they are already committed other places. But he is a heck of a nice guy. Nope he won’t win the Sec east his first 2 seasons. In fact the way things are in Gaine$ville we may not beat Tennessee or Vandy for the next century but hey we can always rely on beating georgia!!! That 42-7 beat down the gators put on them dawgs. That won’t be forgot any time soon!!! Bahahahaha!!!! Hey get this folks. Some obvious doggy fan just told me I had it backward? Can you believe how dumb those Athens country boys are??? They even claim to lead the series not that I know or even care!!!! I’m all about today. WHAT HAVE YOU DONE FOR ME LATELY???? To bad georgia lost the east again, only this time Tennessee beat them and us!!! No wait, we won didn’t we? Why did we fire coach Mac again? Oh well you’ll need to forgive me. These dumb doggy fans got me mixed up. But hey, now we got Mullen!!! I didn’t watch that game but I heard his miss state dogs really put a beating on georgia!!! Showed old Kirby who the man was!!! Hey Corral WE DONT NEED YOU HERE!!! We are getting Justin Fields ain’t you heard??? But he will need a year of just sitting and learning at the feet of captain average M Zaire!!! I bet when Dan talked to Fields old Corral got scared and angry. But he should have known a kid who went to school here in florida was gonna choose the gators!!! Gosh how stupid some people can be!!!! PS. BY THE WAY. WHO DO WE PLAY IN THE PLAYOFFS THIS YEAR? Penn state or Ohio State??? I just hope we get a chance at revenge against michigan state. We would have been unbeaten if not for that opening game. Well we will be national champs anyway!!! Since we won against Tennessee, that makes us the brand new CHAMPIONS OF LIFE!!! 2 titles in one year!!!! No make it 4!!! #1 sec east, #2 sec champs and #3 and #4 are LIFE CHAMPS and I’m just assuming the rest. We all know the natty is in the bag this year. I do feel sorry for that dumpster fire over in athens. Did they win even one this year? Oh yea they beat Ap state big deal. Oh and they beat Missouri but then SO DOES EVERYONE WITH AN ABOVE AVERAGE PONY LEAGUE TEAM. Can you believe Missouri fired Butch Jones??? Wow, big mistake. Firing the creator of the LIFE CHAMIONSHIP. Maybe we can get him on our staff??? Dan go recruit Butch. Has he committed or signed yet? If only committed he is fair game!!! Let’s make coach Jones a priority. Wow I see a dynasty ahead of us starting now and for at least we’ll a while. Maybe Tennessee can fire Pruitt and coach Mac can land there. PS. Don’t forget my royalties and hey team. DONT COMMIT ANY MORE FELONIES!!!!! We got by this year but next year we might need 7, 8, possibly up to 10 or so of you. Good thing we did so well. Good thing we are the MIGHTY GATORS or coach Mac may have said you got him fired or made him have a bad season. We all know our uniforms alone win games. But people will start to talk. I bet those same UGA fans who are bitter about their season. The ones who are calling poor Baker J Mansfield and giving him static about losing to Ohio state this year. They are just rude and STUPID enough to try to say our players got Mac fired. THEY SURE WOULD!!!! Luckily they couldn’t because of our dominance. But hey, they were sure saying that when we lost to michigan state first game. So let’s show them how much smarter we are than them. Everything in the state of Florida is better and smarter than there or anywhere!!! What? Are you tripping or are you always this obtuse? You can’t be a Gator. Go troll some other site. Are you autistic? I think you might be autistic. I think Corral would have been fine in this offense to be quite honest. I do however believe Mullen played it the way he needed to. Let’s be real if Corral wanted to play for UF he comes if he truly wants and believes he can succeed. He said the right things but when it came down to it he was looking for the best opportunity and was not bought in. Can’t hate on the kid just say la vie as sometimes this is how things go in recruiting. You know what is funny it started by Shea Patterson going to Michigan then Corral to Ole Miss and I would not be surprised if that FLA kid Joe Milton the Michigan recruit might get a look see on changing his mind. A big Cam Newton type QB that if all other targets don’t pan out he might revisit his Michigan commitment. If so, it is funny how things work out and quite possibly for the best for all involved. Not a chance in hell you read your own writing. Ricky McRambler. I applaud and encourage these kinds of posts because unless this individual is talented enough to type and drive then this kind of behavior keeps these kinds of people off the road and allows them to focus on protecting their bridge as the curse decrees! Hey 1974GATOR, my post got deleted. To make a long story short. I was unable to keep up with GATOR football this last season. I was out of the country for my job in a place with no tv, radio, internet or even a newspaper. But we were able to get letters from family and friends about every 2 months. Well a buddy was keeping me posted on the season and we were going to rematch it all on DVR recordings he was supposed to have along with YouTube. As it turned out,IT WAS A LONG STANDING JOKE THAT HE THOUGHT WAS FUNNY AS H?LL!! He did tell me about Matt Corral and Justin Fields also. Only he made it seem like we were getting both, DONE DEAL type thing. So I was Solomon EXCITED and yet sooooooo angry at the same time that we were fireing a 2 x sec east champion coach, who was now an SEC CHAMPION!!! Remember I WAS MISINFORMED? So I thought we had truly beaten georgia 42-7 and that they were a dumpster fire!!!!!! I had no clue what was ablaze in athens. I was very angry honestly about the firing of coach Mac. (BECAUSE I WAS LED TO BELIEVE WE HAD FINALLY WON THE SEC WITH ONLY 1 LOSS.) I THOUGHT, WHAT THE HE?L??? So in short . SOMEONE PLAYED A NASTY TRICK ON ME. THAT THEY THOUGHT WAS FUNNY APPARENTLY. The rest of the insanity was just my way of blowing off steam. Plus when your angry EXCITED you make mistakes. So, I am only human but yes I AM A GATOR !!!!!! This was about the first article I came across when I got back home. I read a few other things but I thought it was just the usual haters!!! Once I realised it was for real I was alright with getting coach Mullen after all. So my apology to anyone that didn’t understand. So please stop filling my inbox up with hate mail whoever did that!!!!! I’M ALL GATOR and YES he will get all his funin as he calls it back double portion. He is a BAMMER GUY, so I should have known better than to trust him haha. But payback might just be fun. Bridgette I’m trying to say I’m a girl I only go by Tom because that’s my dad’s name. This is his darned tablet and my temporary email. I’m using his for now. I’m not real internet savvy. You may have guessed that. I just accidentally sent another stupid post through mispelled. I was trying to say nopesters which is just a word I say and it came through as molesters or something I thing. But yes I am TOM AS IN TOM BOY!!!!!! I don’t like giving real names buM I suppose first names can’t hurt to bad. So here goes my name is Marilyn and YES I do have blonde hair which explains a lot haha. : ) No I am not really a tomboy but I do love my GATOR football. Well let’s say I’m a girly girl who is a little bit of a tomboy when it comes to sports. No Marilyn Monroe jokes either or I’m going back to using Tom haha.